You may have won the last 500 years, but you’ll never colonize Space!!! Just as District 9 indicated that there are enough realistic big-budget blockbuster movies about the horrors of apartheid in South Africa, there are apparently enough realistic big-budget blockbuster movies about the American genocide, according to Avatar. Just kidding. I know the value of a sci-fi satire as well as anybody. But these are actual historical events, the repercussions of which persist today and are largely unrecognized by the cultural mainstream that Cameron is playing with, so heavy on the “real 3D” and CGI and lite on the story and context. I would love to see a realistic epic historical blockbuster movie about people of color battling invaders and oppressors. Hollywood does epic European versus European very well (see Braveheart) but notably Mel Gibson’s Apocalypto faded to black just before Jaguar Paw and his folks’ impending struggle against the arriving Europeans; the villians in that flick were Mayans. Danny Glover’s plans to create an epic film about the Haitian Revolution and Toussaint L’Overture have been stalled more than a decade, as financing has been a real problem. Akin to the fishiness pointed out by comedian Paul Mooney of a couple blockbusters of the early 2000’s [“First you had The Last Samurai starring Tom Cruise. Then you had The Mexican starring Brad Pitt”], like authorities terming Zapotec Mexicans aliens for setting foot in Arizona, the indigenous people of Avatar also happen to be aliens. Writer, director and producer Cameron tells a story of plundering land and attempting to destroy a people who were living in harmony with nature in the name of a outrageously coveted mineral (actually called “unobtanium”) – IN SPACE. But wait a minute. Leaving aside the Dances With Wolves plotline, isn’t there value to the themes of Avatar? What about the kids – they’re hearing the lessons of live in harmony with nature, don’t take what you don’t need, honor your ancestors and (ahem) paint with all the glow-in-the-dark colors of the wind. 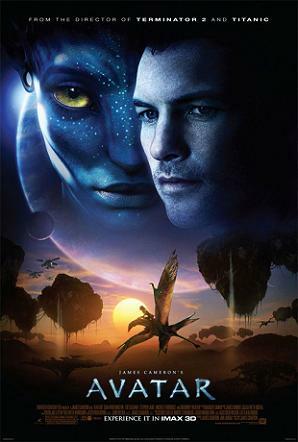 The story that emerges has many touching moments, as the Na’vi culture (aesthetically like a glow-in-the-dark combination of Lakota and Masai – only the people are massive, catlike and blue) believes that all energy is enduring and that they can communicate with their ancestors through nature – cool, right? It’s not often that you hear those sentiments expressed on the screen – big or small. And the $500 million spectacle that unfolds on the screen is not to believed. Thanks to the “real 3D” that I saw it in, even things like the foreground edges of desks seemed real enough to touch. But the creation of an indigenous culture from whole cloth by Cameron is a little weird. Though the Na’vi are grounded in nature, there is also something subtly high tech about them – their natural world glows neon like a Tokyo nightclub and they can “upload and download” ancestral memories from fiber-optic trees and communicate with animals by literally plugging in their long braids (as emphatically pointed out by Sigourney Weaver’s scientist, still game to tromp around a space ship in cargo shorts and an undershirt). Also, when hero Jake Sully’s Na’vi avatar appears, they don’t seem to question how a “sky person” could inhabit the body of one of their own, but then are horrified when he turns out to be an avatar. This is just one part of the eerie blue pall of condescension that Cameron casts over the people of his imagination. Leaving aside all of that, Avatar provides an intriguing parallel universe story of victory of people and nature over colonization and exploitation. The film has been endorsed by President Evo Morales of Bolivia (after he saw it in his third ever trip to the movies) and condemned by the Vatican, which is offended at the suggestion that nature can replace religion (sort of like they were during the 15th Century). But $500 million could probably finance five epic historical blockbusters of actual battles between indigenous people and colonizers (lite on the CGI, heavy on the story and context). Which ones would you like to see?